Kevin Cron and Steve Menendian preview Masters 25 with the reprint of Doomsday, and review Arabian Nights. In June 1997, Weatherlight, the 11th Magic expansion, set sail. This conclusion to Mirage block was the beginning of a new storyline. Although a smaller set, it packed a punch. The most explosive card in the set was a mystifier that has intrigued Magic players for more than two decades now: Doomsday. Some Magic cards unavoidably induce a whir of mental activity, as the discovery of their mere existence prompts the mind to search for ways to abuse it. Doomsday illustrates this principles to the extreme. At its most basic level, Doomsday is a drastic and irrevocable action that compresses all that a player has, and might ever draw, into a five card library, washing out the rest of the library and graveyard in the process. 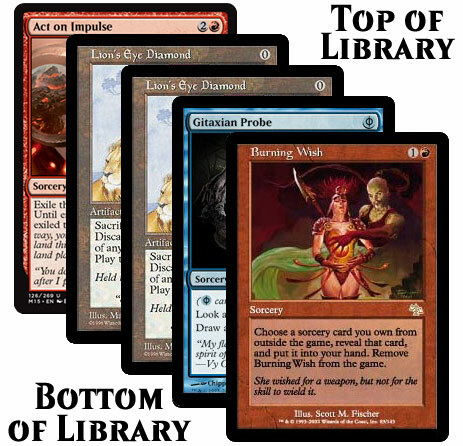 Being able to tutor for your best cards raises a natural question: how can you win the game, and quickly, by doing so? The compression effect belies the adroit skill needed to wield such a tool. 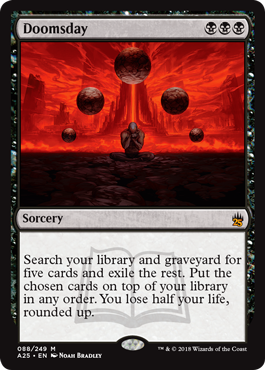 Not only must a player simultaneously select 5 cards from a graveyard and library (one more than the infamous Gifts Ungiven can tutor up), but you must then order them in an optimal constellation. The sheer quantity of possible Doomsday piles in any given 60 card deck is enormous, like calculating the odds a perfect NCAA March Madness bracket. Casting Doomsday is a play that is as risky as it is bold. It is not simply the fact that with so many possible options in both card selection and sequencing that there is ample room for suboptimization. It’s that the cost of making a mistake is so great. A single miscue or miscalculation is prelude to defeat. At the same time, the precariousness of resolving Doomsday is belied by the number of ways an opponent might disrupt your plan. If an opponent plays a card that shuffles your library, like Extirpate, they can disrupt your sequencing and timing, perhaps fatally so. If an opponent counters a single draw spell or threat, there is rarely a viable backup plan. Doomsday is an all-or-nothing play. The risks and inherent danger of wielding such a powerful spell are hardly enough to keep the most daring players from trying. It did not take players long to find ways to abuse this tremendous card. Creating Timetwister loops is one of the earliest combinations in the game of Magic. 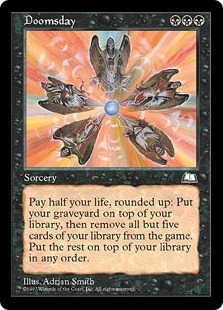 In the Wild Era of Magic, a Timetwister could recycle a played Timetwister in an endless cycle. After the institution of Banned and Restricted Lists, Regrowth and Timetwister were paired as a potential endless combo. These strategies had various names: Recursion, Vercursion, and so on. But the heart of these decks was casting Timetwister for a burst of cards, and then Regrowth to replay Timetwister, which puts Regrowth back into your library to eventually recycle Timetwister. This simple 3 step sequence could be conducted ad infinitum. With his “looping deck,” the inaugural Magic Champion Zak Dolan was a pioneer of this strategy, and built a deck that was designed to set up this combo to gain infinite life and inflict infinite damage. But it took enormous effort to reach that point. One needed to survive long enough to develop a board, draw most of one’s library, and resolve cards like Stone Calendar. It was not until the printing of Doomsday that this combo could be set up nearly effortlessly. A Norwegian by the name of Kristoffer played a Type 1 Doomsday deck to a Top 4 finish in a local tournament in December 1997, with an innovative concept. 1) Draw (however you can) and cast Timetwister. You should have at least 1 card in your graveyard (Doomsday itself), 4 more cards in your library, and you will need at least 2 cards in your hand before you cast Doomsday to not deck yourself. 2) Play Black Lotus and Lion’s Eye Diamond. 3) Cast Regrowth targeting Timetwister, holding priority so that you can sacrifice Lion’s Eye Diamond for UUU. 4) Replay Timetwister, with one mana floating. 5) Repeat steps 2-4 until you have enough mana to cast Braingeyser on your opponent to deck them. This can mean Timetwistering as many as 50 or so times. This combo is protected by having a City of Solitude in play before you cast Doomsday, or even better, by having cast Abeyance on the opponent before playing Doomsday. The combo is much easier, however, if one of the additional cards is another Lion’s Eye Diamond, as this will speed up the number of times you need to loop each combo to win. 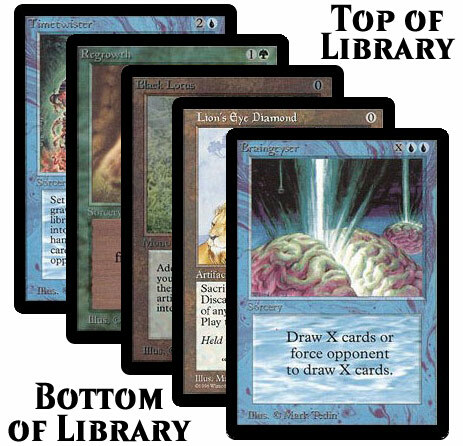 In the Origins Team Challenge in the summer of 1998, Andrew Cuneo of Team CMU refined this strategy into a more streamlined deck. Teammate Randy Buehler posted a brief write-up of this amazing event that described one of Andrew’s kills on behalf of their team. Doomsday was unceremoniously restricted in Type I in 1999, in a sweeping cleanup of the Type I format, along with 17 other cards. Whether it deserved to be restricted at that time or not is open to debate, but there it lived for half a decade. Doomsday was unexpectedly unrestricted in Vintage (Type 1 was rebranded at the same time) in September 2004. It did not take long to find a new, more efficient way to win the game with this enabler. 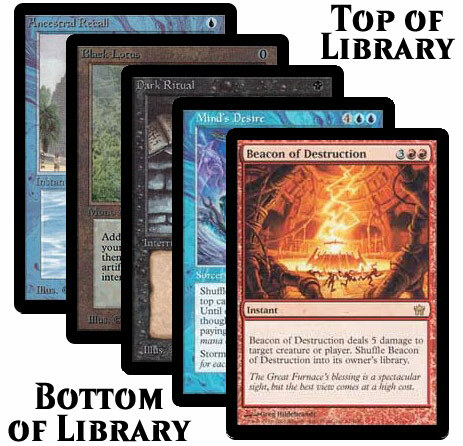 4) Reveal Beacon of Destruction (allowing it to shuffle back into your library upon resolution), and flip it three more times to inflict 20 damage and win the game. The printing or Research/Development a few years later gave Doomsday players more flexibility, as Owen Turtenwald illustrates here. Research could replace the final deck slot, and Mind’s Desire could now cast any card you could imagine from your sideboard (or main deck), giving much greater flexibility in execution. This was a powerful upgrade over the Beacon kill. But the real game changer came with Innistrad. 1) Cast Ancestral to draw Lotus and Maniac. 2) Cast Maniac off of Black Lotus. 3) Cast Gush to win the game. 1) Cast Gush to draw Ancestral Recall and Lotus Petal. 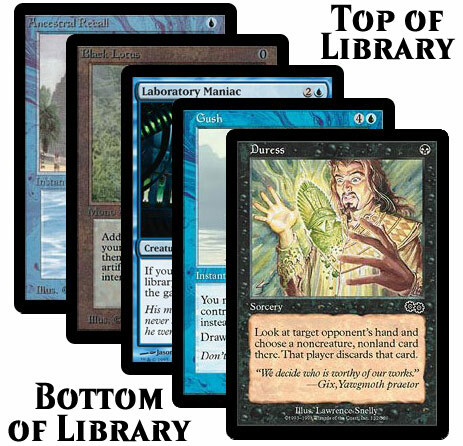 2) Play Ancestral off of the Petal to draw Black Lotus, Maniac, and Probe. 3) Cast Maniac off of the Lotus. 4) Cast Probe to win the game. I Top 8’ed the large annual Waterbury tournament with this updated Doomsday deck. The restrictions of Gush and Gitaxian Probe collaterally damaged Doomsday’s current potential in Vintage, but not likely forever. As this short history lessons shows, Doomsday is a powerful spell for a Vintage mage and will come to the fore when the moment – and cards – are right. But Vintage is not the only format to employ Doomsday. It has also proven to be a force in in Legacy. Act on Impulse has the valuable effect of allowing Lion’s Eye Diamond to function similar to Black Lotus. With just a few storm, this is a lethal finish. 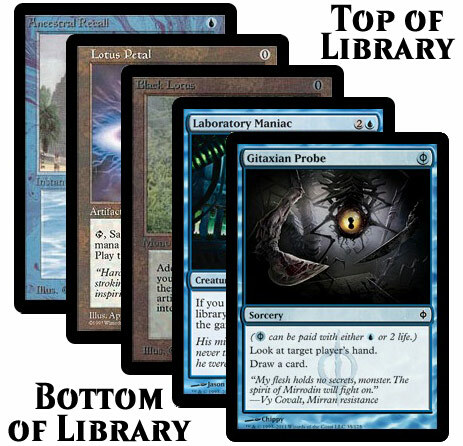 A little more than a half decade back, I developed a powerful Legacy list around another innovative combo, which can be found in the free puzzle articles below. The sky is the limit. So what a fitting way to celebrate Magic’s 25th anniversary but with a reprint of its most skill intensive card? We are proud to announce DOOMSDAY, in Masters 25.